I have an obsession. Cloth diapers. I seriously love Morrison’s diapers. He has never had a diaper rash and the diapers are about as cute as a diaper can be. He’s 10 months old and has never had a diaper rash (update: he’s 23 months old and still no rashes!). Yes, I have to do laundry. But doing laundry is pushing a button. I would rather do laundry than deal with trash. And speaking of trash, no diaper genies or other gadgets to try to trap the smell. The cloth just don’t smell as bad. 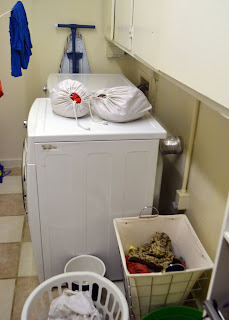 I flush the dirty parts and when the wet bag (washable waterproof bag) is full, I just walk it to the laundry room. So that’s less than $800!!! And if I have a 2nd child, I already have everything except $150 worth of more wipe solution. So that’s less than $1,000 for diapering 2 kids. Disposables for 2 kids is $4,000+. Yes, there is laundry costs, it’s not thousands of dollars. So cute! When I see disposables, they just look trashy (pardon the pun). No offense, I just like my Fuzzibunz. I have never had a blow out. I have had wet leaks, but not dirty leaks. They are swim diapers. You don’t need a special swim diaper. 28 diapers (update: I now have 29 because I got a cow print diaper!). We use 8-10 in a 24 hr. period. So that’s right at 3 days worth. I also use cloth wipes. They are awesome. I have 36 (6 packs of 6). I use wet bags. They are the perfect size for the diaper bag and are water and smell proof enough. I hang the wet bag by his changing table (the diapers do not smell near as bad as disposables). When it’s full, I just walk it to the laundry room. And here’s my laundry room. Glamorous. Them: But how do you wash them? Me: Just like regular laundry. Them: But how do you soak them? Me: I don’t. You don’t have to soak these, just wash them. It can go on like that for a bit. And I’m not trying to poke fun, it’s all questions I had at one time as well. And probably read something like this on a site somewhere that made it all seem so simple. Which it is. So here’s me doing laundry. I just turn the bag inside out. I wash the diapers, wipes, and bags in a load by themselves. And I dry them in the dryer (some people line dry). And now time to fold. The diapers come with 2 inserts per diaper. Until about a month ago (8 or 9 months old), I used 1 insert during the day and 2 at night. Now it’s 2 during the day and 3 at night. He’s fine during the day. But not at night. He sleeps 10-12 hours / night, which is a long time for a diaper (which is an awesome problem to have). So I hemp inserts at night. The diapers came with microfleece which is synthetic. The natural hemp is more absorbent. The hemp inserts are amazing! They really are more absorbent and did the trick. He now sleeps 10-12 hours per night with little or no leaking. The diapers are adjustable in the waist and the legs. Here’s a view of the adjustable elastic. Morrison started wearing them the day he came home. He was 32 days old. They fit him then and still fit 9 months later (update: still fit at 23 months!). Now I will say, I would not take cloth to the hospital with me at a delivery. Even if I have a biological child in the future, we will use disposables in the hospital. The reason is that there is quite a bit of fiddling with the sizing to get it right. It took us a good half hour to figure out the size. And then it takes another half hour to adjust all of the diapers. I just wouldn’t want to mess with that in the hospital. I use cloth wipes.They are awesome. Perfect softness and thickness. I make a wipe solution. Read more about the wipe solution and other recipes here and here. 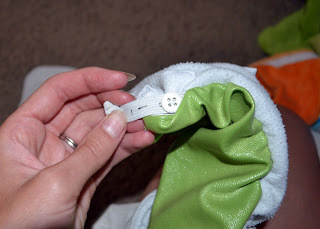 I loved these cloth diapers when my kids were babies! They are a lot easier than people think! We love our cloth diapers too!! Although I did have my husband make me a diaper sprayer and I love it! I have never had a problem with it making a mess and I honestly couldn’t cloth diaper without it!! That’s great! I don’t hear many good reviews about the sprayer. I am so glad it is working for you!! Hey! Just stopped by from Time for Mom – I love this post! We cloth diaper too and I completely agree with all your reasons. You have such a pretty stash! 🙂 We use Fuzzibunz too as well as BumGenius…love them both! Thanks for stopping by! I have friends that love BumGenius. Returned the bloglovin! Just an fyi, if you are using essential oils in your wipes solution then you need a glass or stainless steel spray bottle. The oils can leech chemicals from the plastic. My daughter is three months old and has never had a diaper rash. I just use plain water in my wipes. We’ll see how that works when she’s not exclusively breastfed! Great article! Hi! I’ve been using Fuzzibunz one size and prefolds/covers with my baby since he was a week old (8weeks now). I LOVE my prefolds and covers, but I canNOT use the Fuzzibunz without them leaking! I feel like I’ve exhausted the size settings, stripped and tried everything but they still leak at the waist! What am I doing wrong? Thanks for the tip! I am new to using essential oils and still learning. Thanks & congrats on the new baby!!!! Other than the size settings, I don’t know what it could be. Maybe the FB cut & fit just don’t fit your little one. I have spoken with their customer service before & got great & quick response. They may have some tips. I have noticed that sometimes when it seems the waist is too tight on my guy, it’s actually the legs that need to be adjusted (loosening the legs allow the waist to sit higher, so the waist is set a little smaller). Sorry I don’t have any magic tips… Good luck! Its a great post.There is a huge collection of baby cloth diapers. I really enjoyed your post .Its really a helpful post.Thanks for sharing The post . How often do you launder them and what setting on your washing machine do you use (does your front loader use minimal water) and lastly, what detergent do you use? Hi Jerrica! I wash about every 3 days. I have enough diapers (29 diapers) to last about 3 days. You wouldn’t want to wait much longer than that anyway (I wouldn’t want dirty diapers just soaking for a week…..). I put them on just the regular setting. Yes, front load washer and it uses minimal water. It cleans them perfectly! I usually dry them in the dryer, but do very occasionally (very rarely) line dry them just to get some fresh air and sunshine on them. I use Eco Nuts liquid (find it here http://amzn.to/L2ww0Q). I have no problems with smell or stains using that detergent and it’s a very natural product. Good luck with your diapers! !